The Centre will help schools, visitors, and everyone living in and around Retford to know about these amazing people and understand how they still make a significant difference to our lives today, 400 years on. The stories are told through pictorial displays and the latest technology and describe the people and events that took place, what their life was like in those times and how they survived, as well as the story of the Pilgrims and the associated religious aspects. The centre will be of interest to all ages and includes a special area for children to enjoy. 400 years ago, the region was at the forefront of religious thinking. One group was so passionate about religious freedom that they risked their lives to travel to Holland and then on to America. 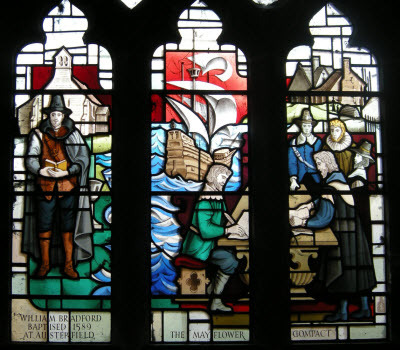 They became known as the Pilgrim Fathers and were the forefathers of modern day America. Their beliefs in personal freedom, through the Mayflower Compact, were to ultimately influence the American Constitution, arguably the most important document in the Western World. However, there is much more to the story because the group and their contemporaries also founded the Baptist and Congregational denominations. The area in and around Bassetlaw, North Nottinghamshire, is one of the most important centres of religious heritage worldwide, but the fact is virtually unrecognised. The new Mayflower Pilgrims Visitor Centre is dedicated to these pioneers and aims to raise awareness of their origins from the Bassetlaw region, their story and how they shaped history. The Centre will be open to the public from 10am Saturday 27th May, with a special opening on Sunday 28th and Monday 29th as part of the Retford Arts Festival. Normal open hours will be the same as The Hub: 10am – 4pm Monday – Saturday, except Tuesday 10am- 1pm. Closed on Sundays.